One of the best parts about fishing in Alaska is the fresh Halibut! To ensure great taste it is very important to take good care of your catch. And it begins the moment you get your fish in the net. You want to be sure to bleed your catch, this ensures the best quality of meat. Next, keep it as cool as possible in a cooler or the fish box of the boat. When you fillet your fish, remove any blood and bones. Rinse off the slime and vacuum pack your fillets to prevent freezer burn and lock in the freshness. 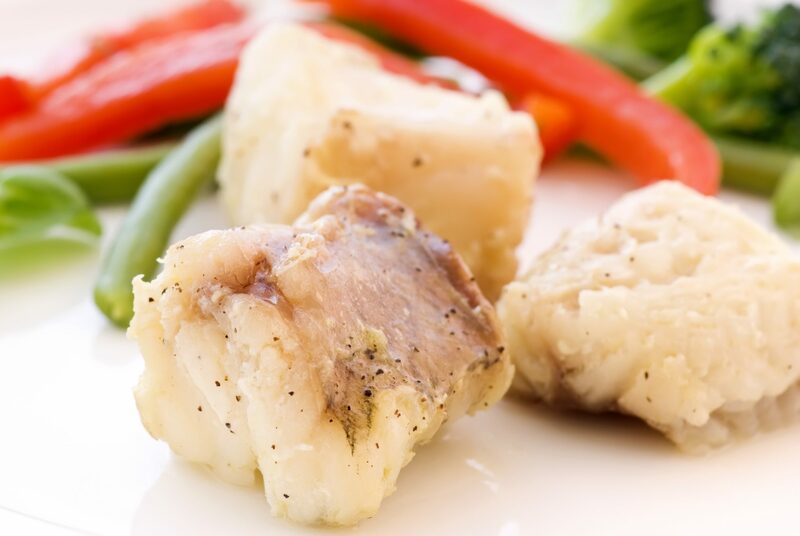 Thaw your Halibut in the refrigerator overnight. When you pull it out first carefully remove the skin with a filet knife, if not already done. Hint: This step is usually easier while half thawed. Next rinse the filets thoroughly, using cold water to prevent accidentally pre-cooking. Carefully slice the Halibut into roughly 3/4 in. chunks and rinse again in cold water. Pat Halibut chunks dry and set aside. Fill a large saucepan with 8 Cups of water. Add a ½ cup sugar and a ½ cup of salt and bring to a rolling boil. Carefully add chunks of Halibut and boil for about 75-90 seconds. After about 45 seconds the Halibut will begin to float. When this happens, continue to cook for about 30 seconds. Scoop out your Halibut with a slotted spoon and place on paper towels to dry. At this point you can check to see if the Halibut is done, you want the center of the fish to be just slightly undone. The fish will continue to cook as it rests. Let rest for 5-10 minutes and then check doneness. Melt butter in a dish while you wait. Serve finished Halibut with lemon juice and melted butter.